Mary Jane Truby was the first-born child of wealthy farmer and landowner Simon Truby of Apollo PA. So you might have expected that she’d be destined for a life of privilege & ease. But Mary Jane Truby’s life instead seemed marked by heartbreak and tragedy. Though she’d married into another prominent local family—the Henrys—the secure life that Mary Jane and her husband tried to build for their children had crumbled away before their eldest child had turned 16. Mary Jane’s first significant loss occurred at age 6, when her mother Sarah Woodward Truby died in 1844—just months after Simon Truby had purchased his 156-acre farmland in today’s Apollo & North Apollo. Mary Jane and her 4-year-old sister Juliana were left in the care of their widowed 38-year-old dad, Simon Truby (1806-1886). Simon had remarried by about 1850 and proceeded to have 7 more children over the next decade-plus with his new wife, Elizabeth Hill Truby. As the oldest child, Mary Jane likely took on a caretaking role for her many younger half-siblings. Simon Truby’s farmhouse on Terrace Ave in Apollo, built c. 1844. In 1850, twelve-year-old Mary Jane and her 10-year-old sister Juliana were living in the 8-room Truby farmhouse at 708 Terrace Ave with their new siblings Hannah (4) and Henry (1), and of course parents Simon and Elizabeth. By 1860, both Mary Jane and Juliana Truby were young adults in their early 20s, yet still living in the farmhouse with parents Simon and Elizabeth Truby. By now, 3 more children had joined the household, making a total of 4 adults and 5 children residing within. Youngsters included Hannah (13), Henry (11), Isabela, or Belle (8), Albert (6), and Winchester Truby (4). Perhaps it’s no surprise that Mary Jane opted to break free of her father’s farmhouse within the next few years by marrying William Henry Henry, who himself was the first-born son in a local farming family. Like Mary Jane, William had lost his mother (Clarissa Henry) early on, when he was just 4 years old and his sisters Clarissa Anna and Louisa were just 6 and 3, respectively. William’s dad too had remarried and fathered an additional 11 children with his 2nd wife, Mary Talmage Henry. 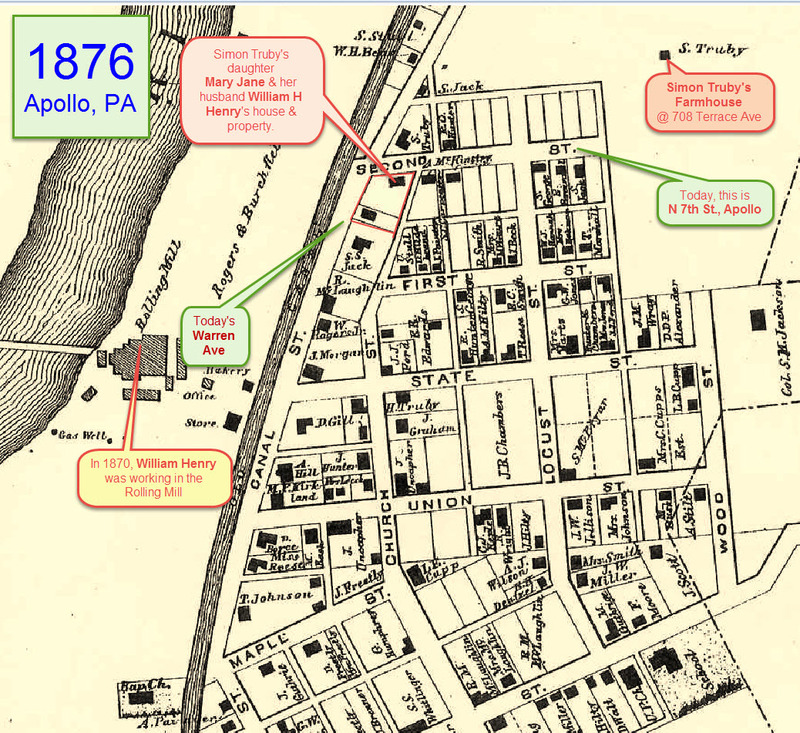 In fact, one of William Henry Henry’s half-brothers was local historian and physician Dr. Thomas J Henry, author of History of Apollo, Pennsylvania: The Year of a Hundred Years: 1816-1916, published in 1916 and available in print from the Apollo Area Historical Society. Mary Jane Truby likely married William Henry Henry after 1864, when he returned from serving in the Civil War. William had enlisted in the Union’s Company I, Pennsylvania 78th Volunteer Infantry in October 1861. He was promoted to full sergeant in 1863. His military records list his occupation as Stone Mason, which was the same profession as his father, Alexander Henry (1818-1885). Alexander Henry was himself an interesting and accomplished citizen who helped to build industrial furnaces and mills in Apollo and Leechburg; read a bit more about William’s dad Alexander Henry here in this 1906 History of Westmoreland County, Vol. 2. In 1870, the young couple Mary Jane and William Henry shelled out $200 to purchase one-third of an acre of land from Mary Jane’s dad Simon Truby (link to a PDF of the deed). The property was located at the foot of today’s North 7th Street (then known as Second Street) in Apollo. Census records suggest that Mary Jane (age 28) and William H. Henry (age 27) were likely living in this location in 1870 with their 2 children: Harry T Henry, age 4, and Bertha Henry, age 2. Henry’s occupation was listed as working in the nearby Rolling Mill, which was across the canal and a little south of his home. In 1870, Mary Jane & William Henry purchased one-third of an acre of land from Simon Truby at the foot of N 7th Street (then known as Second Street). The couple erected a frame house along N 7th Street and another frame structure along Warren Ave (then known as Canal Street); both buildings are represented as black rectangles. Click image to open larger version of map. William Henry was “one of the highly esteemed and influential citizens of Armstrong County,” according to the History of Westmoreland County Pennsylvania (1906). He was a Republican, a Mason, and an active member of the Apollo Methodist Episcopal Church. What ever happened to Mary Jane & William Henry’s house in Apollo? Here’s a hint in the photos below…. Click here for more details and related maps/images. By 1880, census records show that the Henry family had moved to Leechburg, where they were closer to William’s sister Louisa and her husband Lewis Bowers. Both families—the Henrys and the Bowers—were living on Main Street in separate dwellings. Louisa and Lewis Bowers owned their home at 127 Main Street, where they lived with their 7 children, who ranged from 2 to 12 years of age. Lewis was a plasterer and had served alongside William Henry during the Civil War in Pennsylvania’s 78th Infantry. 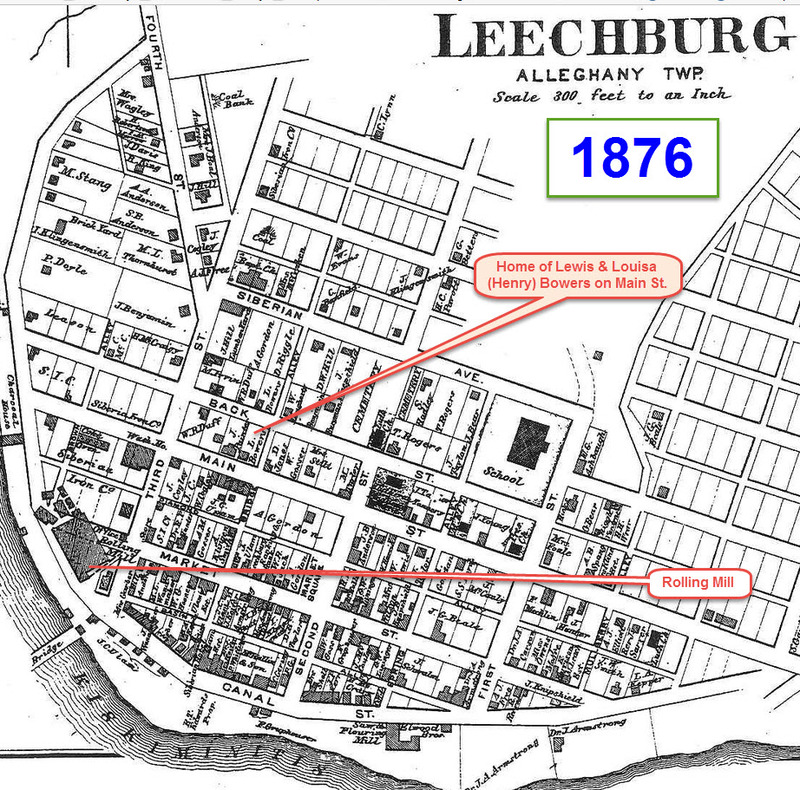 Mary Jane and William H Henry moved with their family to Leechburg and lived on Main Street near William’s sister Louisa and her husband Lewis Bowers. The location of the Henry residence is unknown, but the Bowers were living at the corner of Main Street & Bridge Ave, as shown in the 1876 map above. William Henry was likely working at the Rolling Mill along Canal Street. Click image to open a larger version of the map. Site of Lewis & Louisa Bowers house at 127 Main Street in Leechburg. The home is situated in a location that seems to match the 1876 map above, but this house looks somewhat more modern. It’s possible that portions of the house date back to the 1870s, or the current house might be built on the same foundation as the earlier home. Click image to open a larger version of photo. William and Mary Jane Henry must have been renting their home in Leechburg, as I could find no Leechburg-area land purchases recorded in the Armstrong County courthouse. Thirty-three-year-old William Henry’s occupation was listed as Muck Roller (i.e., he worked in a metal/steel mill), and his 13-year-old son Harry T Henry (the “T” stands for “Truby”) was a clerk in a store. Eleven-year-old Bertha was attending school, and 9-year old Ada was at home with her mom Mary Jane, age 36. In 1881 or 82, Mary Jane and William had a 4th child, William Henry Jr, or Willie. It’s unclear why William and Mary Jane Henry moved away from Apollo, as they retained their property there. Perhaps William had found a better job as a Muck Roller in Leechburg, or maybe he wanted to be closer to his sister and brother-in-law, Louisa and Lewis Bowers. Or it’s possible that William and Mary Jane wanted to get away from her many Truby relatives in Apollo, as there’s some evidence of both supportive and fractious relationships among Simon Truby’s 9 children and their spouses. Most of Simon’s grown children lived uncomfortably close to each other—or perhaps wonderfully near, depending on your perspective—along the edges of Simon Truby’s farmland. In any event, the 1880s would prove to be another fateful decade for Mary Jane Truby and her family. She would first lose her husband in 1882, and then her father in 1886. Her oldest son Harry T, when only 16, had to step into a guardian role for his youngest siblings and take an entry-level job in the steel mill. Another article in the Indiana Progress, published Thu, June 29, 1882, stated: “A Stricker at the Leechburg rolling mill, named W. H. Henry, recently committed suicide by cutting his throat with a razor. Temporary insanity is said to have been the cause.” (Thank you to Lewis Bowers descendant Joyce Frey for sharing this information). From the Indiana Democrat newspaper, June 29, 1882. It’s hard to imagine what life must have been like for the Henry family in the immediate aftermath of this tragedy. I first wondered which of William’s 2 sons had been sent upstairs to waken him. The most likely was the youngest, Willie, who may have been only 2 years old at the time. It seems unlikely that 15-year-old Harry T would have witnessed his father’s death scene and then reported to his mom that his dad would not awaken. Within weeks after his dad’s death, Harry T Henry was working in the shops of the Apollo Iron & Steel company, “beginning at the bottom, as scrap boy, and working his way up through the positions of opener, doubler, matcher, and rougher,” according to the History of Westmoreland County Pennsylvania. Which sister, we might wonder, was “partially insane” (if the article is to be trusted). Might it be Louisa, wife of the dying Lewis Bowers? Or perhaps William’s older sister Clarissa Anna (1840-1879) was mentally unstable; she had married Thompson Bair (1885-1910) and had several children. Or is it possible that William Henry was suffering from what today we would call PTSD, or post-traumatic stress disorder, as a result of his Civil War service? And what of William’s wife and children? Were they at increased risk for PTSD after witnessing the aftermath of William’s violent death? Lastly, Lewis Bowers was on his deathbed at age 43; what was he dying from? And did he die within days of William’s death, leaving their two families doubly grieving? A lot of questions, and most will remain unanswered …. Still, some insights might be gleaned by tracking what happened next to William Henry’s widow and children. I did my best to follow the trails of Mary Jane, Harry T, Bertha, Ada, Willie, and their offspring. I also tried to track down their houses. What did I learn? Find out in an upcoming blog post. In essence: be assured that resilience can arise in the aftermath of adversity … hey, that sounds like a good title for a blog article! Special thank you to Natalie Ann Cunningham, who spent a recent Tuesday morning combing through files and binders in the Genealogy Section of the awesome Apollo Memorial Library to help gather information for this article. As always, please comment below if you have more information about Mary Jane and William H Henry or their offspring. Please let me know if you notice any errors in these posts as well, so I can make corrections. It does get confusing when so many people in the past have the same or similar names. For instance I ran into some inconsistencies when researching the life of William Henry Henry (1841-1882). Most accounts list his father as Alexander Henry, and there’s much supporting evidence that this is true, including in Alexander Henry’s will and writeups in the History of Westmoreland County. However, in some contemporary documents his name is listed as William Henry Jr. (such as in some Civil War records and in the deed between Simon Truby & William Henry). The title “Jr,”of course, would only be appropriate if William’s dad was also named William Henry and not Alexander Henry. There IS another William Henry (1806-1898) who lived in Apollo; he was a long-time Justice of the Peace, but it appears he had no son as a namesake. So as far as I can tell, then, William H Henry – husband of Mary Jane Truby – was the son of Alexander Henry. Just another piece of a perplexing puzzle. as always, leaves me wanting you to hurry to post the next chapter ! I want you to know how much we appreciate all the hours you put into making the past come alive . another great episode awaits ! Thank you Denise! Each story always takes MUCH longer than I think it will to research, write, & find images. But they’re a lot of fun to investigate & then put together. I appreciate your good vibes! I really enjoyed reading this. I know it takes a lot of work. I should take lessons from you on how to do research then maybe I would know how to really started to research my mother’s family. Did you know Ruth Henry who lived up on Oak Hill? I am not sure if her husband’s name was William but I think it was. She has a son name William Henry. He isn’t around here now. I wonder if there is a connection anywhere with those Henry’s back in the 1880’s. This is interesting but it sounds so complicated. I will be looking forward to the next blog. Hi Bonnie – Thank you for the feedback. Yes, the local Henry families are large and complex! The Apollo library has some good info on Henrys, and of course the Apollo Area Historical Society. Though I don’t know Ruth Henry on Oak Hill, I do know that genealogy-wise, Dorothy Walker Henry is the expert on the many complex branches of the Henry family tree. I am a Henry born and raised in Leechburg. IM curious to know if I’m a descendent of this family. Simon Truby was married to Elizabeth Hill, her father was Jacob Hill, his father was John Sqire Hill. The Hill families all built brich houses that had 4 over 4 rooms with a center hall. The Sober’s brick house in Gilpin Twp. on Sober Road is the same as Simon Truby’s. The 1844 Restaurant is all so the same build. I am Lloyd Sober, my ggrand father bought the John Hill farm on Sober Road in 1909. I was always interested in the history of the Hill farm and house. There is also another house that is the same as the other houses, Henrey Hill’s house on Lover Leep Road is also the same. Henrey;s wife was Alvina Hill a sister to Elizabeth. PS, I do genealgy on the Sober and Hill familys and would enjoy hearing from anybody that is interested in exchanging their genealogy.